Maeda started traveled to USA and started teaching. He was approached to engage in a match for money. Since his income was limited at the time, he accepted. This, however, was a violation of Kodokan rules which prohibited members from engaging in matches against other styles. Maeda did not appear to be worried about this and thus his career as a fighter began. He was expelled from the Kodokan for participating in matches against fighters from other styles. Maeda is said to have fought over 2,000 matches in his career, many unrecorded. After traveling the world, Maeda landed in Brazil. When Maeda ended up arriving in Brazil, he met Gastão Gracie who was a business partner of the American Circus in Belém. In 1916, Italian Argentine circus Queirolo Brothers staged shows there and presented Maeda. In 1917, Carlos Gracie—14 year old son of Gastão Gracie, watched a demonstration by Maeda at the Da Paz Theatre and decided to learn judo (also known at the time as ‘Kano Jiu-Jitsu’). ​Maeda accepted Gracie as a student, and the youth went on to become a great exponent of the art and ultimately, with his younger brother Hélio Gracie, founded Gracie Jiu-Jitsu, modern Brazilian Jiu-Jitsu. In 1921, Gastão Gracie and his family moved to Rio de Janeiro. Carlos, then 17 years old, passed Maeda’s teachings on to his brothers Osvaldo, Gastão, and Jorge. Hélio was too young and sick at that time to learn the art, and due to medical imposition was prohibited from taking part in the training sessions, learning instead by watching his brothers. 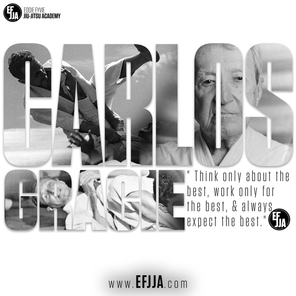 Carlos Gracie is widely credited with being the martial arts patriarch of the famous Gracie family. Born on September 14, 1902, in Belem do Para, Brasil, Carlos and his family moved to Rio de Janeiro while he was still young. There, he began to train in Judo under Mitsuyo Maeda. After several years he was promoted to instructor. According to the family story, his youngest brother Helio once stepped in to teach a class and began modifying techniques to fit his frail body. Seeing how the techniques compensated for the lack of strength by using leverage, Carlos and Helio began to use these modifications to create Gracie Jiu-Jitsu. Carlos founded the first Gracie Jiu-Jitsu Academy and refined his technique by issuing an open challenge to anyone willing to test their skills against him in combat. These open challenge bouts went on for many years, and Carlos fared well. He is reputed to have been undefeated and became known throughout Brazil. Carlos became a Jiu-Jitsu instructor in Rio de Janeiro. Once, he was late to a class. Helio stepped in and began learning first hand how his lack of physical prowess limited his ability to perform the drills he had memorized. He was forced to modify the techniques to account for his lack of strength. 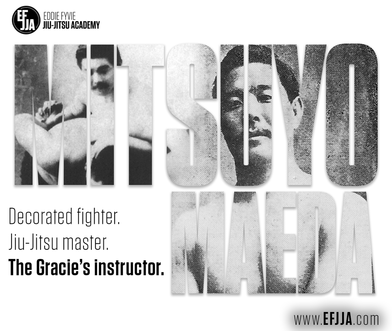 Gracie Jiu-Jitsu was born. He was on a mission to prove his brand of Jiu-Jitsu was superior to all other forms of martial arts. He competed against wrestlers, boxers, and other submission artists for several decades, firmly establishing the Gracie name in the world of combat arts. Helio spent his later years coaching his numerous offspring in Gracie Jiu-Jitsu. He was in his son Royce’s corner in 1993 when he shocked the world by winning UFC 1. 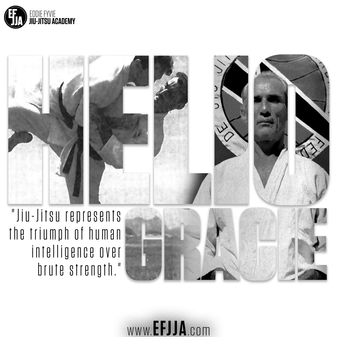 Helio passed away in 2009, but not before the Gracie name was world famous for his particular brand of Jiu-Jitsu.